Discussion in 'Shoes, Shoes, Shoes' started by Alejandro, Oct 23, 2003.
i'm sure you'll rock those shoes anyway Alejandro!!! first of all: are these for real? second: if they are, how come these houses would put their label on a different make (as in; their actual logo "trademark" mixed with the converse logo)? 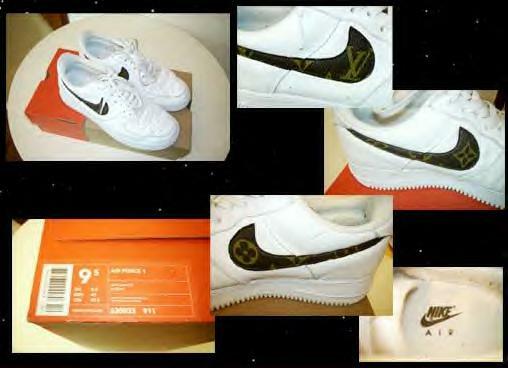 I've seen tons of stuff like this...customized Nike Dunks or Air Force Ones with Gucci or Burberry fabric. People take Nikes and get reproduction logo fabric and then just glue or sew it on. It's kind of a booming bootleg business and there is definitely a demand for this stuff (tons of stuff like it on EBay, for instance). The only legitimate designer logo sneakers I've ever seen were Fendi ones (kind of a low Converse inspired style) sold at Canal Jeans. Even then, you can never be too sure. I'll admit I'm not a fan of this style, either. I don't see the point of logos, real or fake.